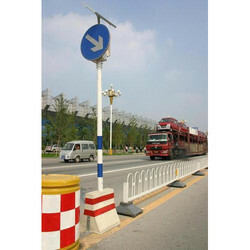 Our esteemed clients can avail a wide array of Road Studs such as Solar Signage. Single mold body with inbult solar panel. 36 hour backuk on full charged battery. Brand: BONS LIGHT PVT. LTD.
Jyoti Rubber And Plastic Co. While climbing on the success ladder, it has become more important for us to provide the best class Solar Signage. These are usual Cautionary and Mandatory Traffic Signs made from High power LEDs which are powered by solar panel and rechargeable battery. The LEDs flash from dusk to dawn making the signs visible from a greater distance than the ordinary reflective signs.